Call it a reverse Green Acres or the second coming of the Beverly Hillbillies, but as of this weekend my family and office are moving from the semi-bucolic San Fernando Valley to the very citified Westside of Los Angeles. While it will be quite an adjustment for this Valley Girl, I’m looking forward to being able to walk to stores, restaurants and the local Coffee Bean (a good inducement to exercise). It will also be fun to be around the corner from Samuel Goldwyn Films, just down the street from Fox Studios and five minutes from the LA County Museum of Art. Because of the logistics involved with the move, and uncertainties around when my office will be fully functioning, I will not be blogging for a week or two. But, luckily for you and me, I have a guest blogger who will be standing in for me while I’m out. Sandra Beckwith is a writer, speaker and coach who wrote the wonderful Publicity for Nonprofits: Generating Media Exposure that Leads to Awareness, Growth and Contributions. 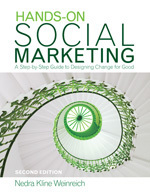 She sent me a copy and I found the book to be a perfect companion to my own Hands-On Social Marketing book. It’s full of step-by-step guidance, worksheets, tip lists, and sample materials, and is laid out in a framework similar to what I used in my book for the (much shorter) PR section. Sandy will be sharing her vast media knowledge and experience with us, and I’m looking forward to reading her posts. In the meantime, you can read a recent interview with her by Chris Forbes. If you try to contact me in the next week or two, please be patient if I am slow to get back to you. Let’s hope I don’t have to make too many sacrifices to the utility gods to get back up and running quickly. Can I tell you a secret? I hate exercise. I go through phases where I do it because I know it’s good for me. Then I stop for a while and start up again months later. I just have a really hard time motivating myself. You would think as a social marketer, I would have some special insight into what would make me want to exercise. What benefits do I value? What barriers need to be taken away to make it happen? But no, I’m just like every other shlub whom the physical activity social marketing programs are trying to get to budge from their desks. I’m the shoemaker who has no shoes. So, I dug out my old Walkman and went for a walk last week for the first time in a couple of months. 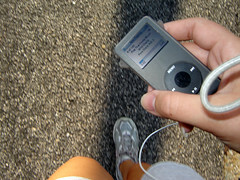 I always like to listen to the radio while I walk, but I had a hard time finding music with a good beat for walking. It was after trying to walk to 30 Seconds to Mars’ song Bury Me and finding myself feeling like I was limping along to try to keep up with the 6/8 beat (a Souza march it wasn’t) that I decided to get an iPod and some optimized exercise music. My deal with myself was that I could buy a used iPod on eBay if I promised to use it to exercise. The iPod arrived today, so I loaded it up with my music and downloaded some exercise music podcasts. I found a couple of places where you can choose the workout music based on the number of beats per minute, so you can find exactly the pace that works for your stride and type of exercise (Podrunner is one source, and fitPod is another). This evening I took the iPod and the selected 1-hour workout mix on their inaugural walk. 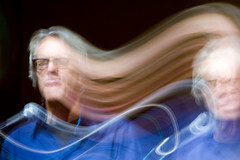 And wow – what a difference it makes to have a beat that matches my stride. My feet just automatically keep pace with the music. But the downside of using these free downloads is that they are all centered around horrid techno music that sounds basically the same from song to song. One song had a breathy Scandinavian woman singing vapid lyrics like “express your emotions.” Another song featured a deep voice saying the word “cee-crisp” over and over to the beat. Yeah, I was wondering what that meant too. At least it took my mind off of the exercise. So the opening night of the iPod walking tour was a success. But I need to find some listenable music. Anyone have suggestions for rock-based workout compilations? I’m not going to start exerblogging (a la fatblogging (LA Times free registration req. )), but if anyone wants to be my virtual exercise partner or share what motivates you to exercise, let me know! My blog friend, fellow introvert, baseball coach and real estate agent Derek Burress recently did an interview with me on his website. It’s a wide-ranging discussion on everything from Berkeley to blogging, social marketing to smokeless tobacco, religion to real estate. It’s kind of long, but it was fun to give my two cents on things I don’t usually write about. Read it if you’ve always wondered where the name “Spare Change” came from. A couple of times today I felt that brief wave of sadness and longing in the pit of my stomach that signals a nostalgic episode. Something will trip a bunch of connected neurons and suddenly I’ll be transported back in time, feeling for a split second like my then-self. Nostalgia can be triggered by all the senses. Sometimes it’s a smell wafting by (like the same cologne worn by the guy in the next dorm room in freshman year of college). Sometimes it’s a song (“Don’t You Forget About Me” by Simple Minds always puts me back into my best friend’s blue Chevy Malibu on a hot June day just on the cusp of high school graduation). A color can get me (the deep crushed purple of my favorite velour shirt in 6th grade). Or a taste can do it (candy necklaces bought for a nickel from the ice cream man). Even a touch (the rose petal softness of any baby’s tummy can take me back to the wonder of being a new mom). Today the first thing that set off my nostalgia was an review of the Police reunion concert in the Wall Street Journal with an accompanying picture of drummer Stewart Copeland. I had a major crush on him in junior high, and even though he has glasses now and is 25 years older, looking at that picture transported me back into the awkward 13 year old with the full-page LA Times ad for the Police concert at the Forum taped to my wall (I didn’t actually go myself, but if I recall, the opening act was Oingo Boingo). I don’t think the nostalgic pull was that I actually wanted to relive those junior high years (ugh! – would anyone willingly go through junior high again?). Maybe it’s more that the picture reminded me of the good feelings I experienced when I looked at his picture back then. The other thing that gave me the nostalgic twinge was Wil Wheaton‘s column recounting his own wistful feelings when revisiting the soundstage where they filmed Star Trek: The Next Generation. He certainly has much more of a connection with the show than I (he was Ensign Wesley Crusher, but now is a writer/blogger/geek-about-town), but being the sci-fi fangirl that I am, I’ve seen every TNG episode at least a few times. As anyone who watches a good show over a long time knows, you develop an emotional connection with the characters. This show was exceptionally well-written and acted, and the deep emotions that fans felt for the show result in a nostalgic desire to reimmerse themselves in that world, as evidenced by Trekkie conventions, USS Enterprise role play sims in Second Life and Vegas reenactments. What does all of this have to do with marketing? Marketers have been using nostalgia as a way of pitching their products for as long as people have been talking about “the good old days.” Look at how things like fashion and music keep coming around in cycles, fueled by generations buying the things they loved for their own children. I was just talking with a friend today about how I owned all the Schoolhouse Rock videos for my kids, having grown up singing about the Constitution and adverbs on Saturday mornings. The new VW Beetle is successful specifically because of nostalgia for the old Bugs. Commercials for cars, soda, and financial services are borrowing licks from 70s rock. Cultural icons like Dennis Hopper, Kermit the Frog and Bob Dylan flack for retirement planning, hybrid cars and women’s underwear. Emotions imprinted during childhood and the teenage years are especially powerful, and by associating our products with those nostalgic memories, we can piggyback on them. First you need to know who your target audience is — 20 year olds will be nostalgic about very different things than 40 year olds, and regional, ethnic and social class differences may exist as well. You could do focus groups where you ask them to name the music, tastes, smells, celebrities, TV shows, etc that they remember fondly and the specific memories associated with them. Focus on the senses, because those are the key to tapping into those nostalgic emotions. You will find that certain things get most everyone nodding wistfully; when that happens, you’ll know you’re onto something. How do you connect your product with that nostalgia? Depending on which senses are involved, you may have to be creative. 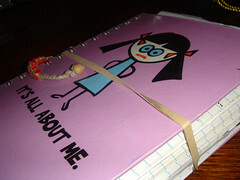 You can use music, celebrity spokespeople (if they used to be hot but have not been for a while, you may even have a better chance of getting their participation), particular graphic styles or fonts, clothes and hairstyles, food or scented giveaways, plays on old catchphrases, or other approaches. You do need to be careful, though, when you are messing around with things that people hold dear to their hearts. If they perceive you as tampering with their cherished icons or that the people associated with them have “sold out,” you may generate a backlash. Now, if you’ll excuse me, I’m going to watch the the Krofft Superstars DVD I bought for my kids. Yeah, yeah, right…for my kids. Call it my blogging Spring Break. For my own sanity and to be able to keep up with my analog work and personal obligations, I had to take a hiatus. But I’m ready to get back into the blogging groove. Social Marketing University, which I led last week in DC, was a great success. The participants were amazing and ended up being a wonderful resource for each other. I was able to meet several people in person whom I only knew via their blogs or through ongoing correspondence, which was a treat. We were lucky to have as guest speakers Ed Maibach, the director of George Washington University’s Public Health Communication and Marketing Program, and Rachel Greenberg, a veteran social marketer who shared a case study from the National Diabetes Education Program. Each time I offer this training, I learn more about how to improve it for the future. This time, the evaluations made it clear that the participants fell into two groups — beginning social marketers who wanted the basics on up, and established marketers who were looking for more advanced training on applying their knowledge to the unique needs of health and social issues. While I thought I had made it clear on the information page that this is a more basic introductory level training (e.g., with quotes from past participants like “This would be a GREAT intro course.” and “I think it is a great training for people who are new to social marketing.”), it’s clear that I will need to make that more explicit and consider offering a more advanced track. Being in Washington DC last week was wonderful and it was great to be back where I had started my social marketing career. My family was with me because we were also there for a family event the following weekend, and we had a great time in the balmy weather on Tuesday paddleboating in the Tidal Basin. We were there in the pause of the cherry blossom buds just before they exploded a couple of days later (which I sadly only had a chance to see in pictures online). There’s no place like DC — I miss feeling like I’m living in the center of the world. But I do not miss feeling like my toes are so cold that they are going to fall off, so I have to keep reminding myself why I came back to Los Angeles. Speaking of living in Los Angeles, today I had a film crew at my house shooting a TV show (NOT “Social Marketers Gone Wild!” as Michael Gibbons suggested to me earlier). More about that in the next post. I’m sad to report that our pet butterfly Crumplewings finally went to the big garden in the sky. This amazing insect taught us all the meaning of courage and persistence. Okay, I’m exaggerating, but even though he emerged from his chrysalid just before the new year with damaged wings, he (don’t ask me how I know it was a male) lived for almost 8 weeks. From what I could find on the web, Painted Lady butterflies usually only live 2-4 weeks, or less in captivity. Was it my longevity-enhancing recipe for sugar water and orange slices that did it? Was it that he increased his lean body mass by shedding pieces of his wings? Or maybe he just had the will to live against all odds. We’ll never know. But I’m sure he outlived most of his brethren who were set free outside a month ago. What are the social marketing or life lessons in all of this (because, of course, there have to be some)? Maybe that you can never predict exactly how someone will respond to adversity, but you should never write them off. Or even if someone does not make a change in their life exactly as you think they are supposed to, they may still succeed by doing it their way. Or that there will always be some in your audience who surprise you by doing exactly what you do not expect. Or that those with their feet on the ground in business last longer than those with their heads in the clouds. Maybe you can come up with some better ones. While we’re on the subject of insects, I found this short video about cicadas and their 17-year life cycle strangely compelling. Good things come to those who wait?